Halloween has come and gone and November is upon us. We are experiencing another brief interlude of Indian Summer, with temperatures heading into the 70’s and bulbs to get in the ground, so much to do in our client’s gardens. We even have some brand new gardens to install in the next few weeks. What a year! The hard frosts in the morning haven’t phased our late blooming perennials. 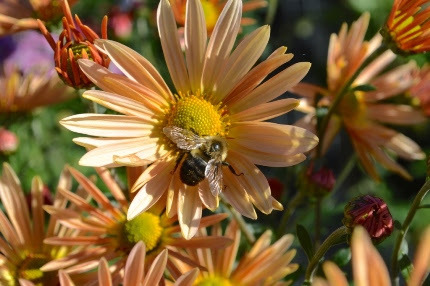 ‘Rustic Glow’ Global Warming mums are blooming like crazy and are covered with bees every day. They are just so pretty, such a bright light on fall days. Late asters are also flowering profusely. In my own gardens, I have monkshood, calendulas, ‘First Light’ sunflowers, and Allium ‘Ozowa’ all abuzz with activity. I am still eating from the garden- escarole, arugula, carrots, baby turnips are on the menu this week. I spent Sunday and part of Mondayweeding, mulching, planting, and rearranging. I also harvested lots of seed pods from asters, ironweed, and ‘Lemon Queen’ sunflowers and tossed them onto my wild back hillside. This passive seed sowing project seems to be working out, as long as I have a few years of patience to allow the process to evolve. back yard where I will use them to mulch my veggie beds as they are emptied. He protested (“why can’t I just pile them along the street like everyone else?”) but I insisted that leaves were garden gold and we needed to keep them all. 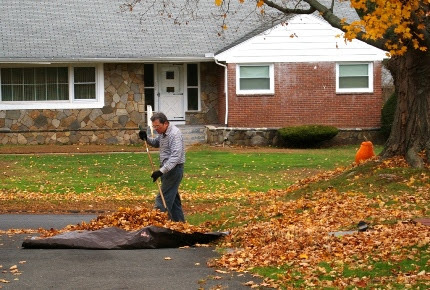 He was the only person on our street rakinginstead of using a noisy leaf blower. Here at the store, we have been fielding lots of questions about leaves. Besides endlessly explaining why leaves should not be thrown away, everyone is worried that oak leaves and pine needles will make the soil more acidic. According to expert Dawn Petinelli, assistant extension educator at the University of CT, research has proven that is not the case. As these organic mulches decompose, biological activity converts them to compost with a relatively neutral pH. 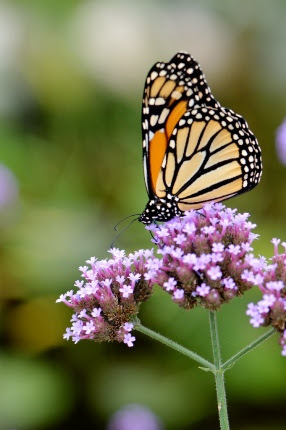 The very last of our monarch butterflies were born and released last week. The final count is over 700 monarchs raised at Natureworks in 2016. To read all about it, link to my friend Frau Zinnie’s excellent blog post. This week we are having our final clearance sale on outdoor plants. They are now all HALF PRICE. You have ONE WEEK to take advantage of these bargains. After that, we clear the decks and start preparing for the arrival of greens and other holiday items. 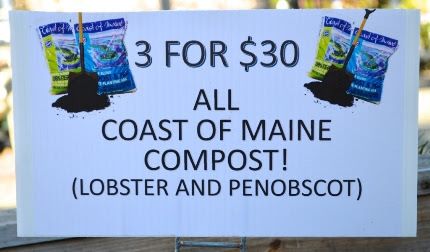 Our Coast of Maine compost is also on sale, as are many wonderful organic pest control products and fertilizers. We are using one bag of compost per rose to hill up our roses to protect them for the winter. In the spring, the compost is spread around the ground under the rose bush and any part of the plant that was covered will be alive, even if the tops have died back. This is a really good thing to do to newly planted roses as well as those that have suffered badly in last year’s open winter and previous years 12 degrees below zero temperatures. 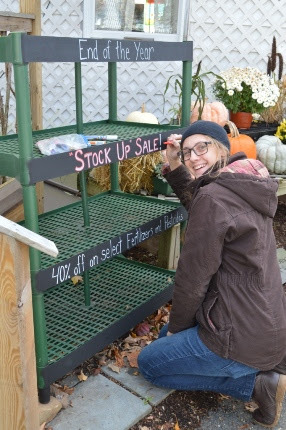 Kassie is shown here setting up our End of the Year Stock Up Sale. Voila! As long as you keep the powders dry and the liquids above freezing (the cellar works great) these products will be perfectly good in the spring of 2017. 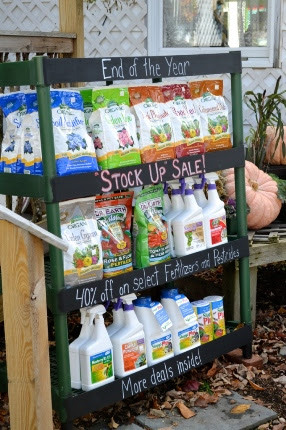 Come in, stock up, and save 40% NOW on products you KNOW you will use next year. 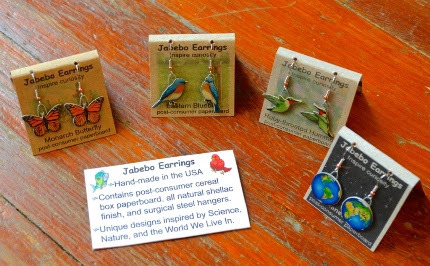 Check out these neat American made earings now in stock in our store. gift items, succulents, and all kinds of cool stuff that will enchant you during the upcoming holiday season. Amber started making succulent pumpkin cornucopia arrangements last week and all of us were oohing and ahing. We are taking orders for these as well as succulent pumpkins of all sizes for the next month. What a fabulous way to decorate your house AND what a thoughtful, unusual hostess gift if you are invited to someone’s house for dinner or a party. This Saturday we are having a Terrarium Making Party in our greenhouse. Jillian will teach you how to make a beautiful terrarium that you can then bring home or give as a gift. In fact, once you see how easy and fun it is to create a terrarium, you might just decide to make a bunch of them for holiday gifts. Everyone loves a hand made gift and terrariums are so easy to personalize. 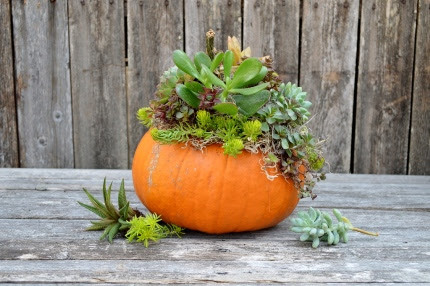 This is the succulent pumpkin we will be making in our workshop this Sunday. Register today! Workshop of the fall season. 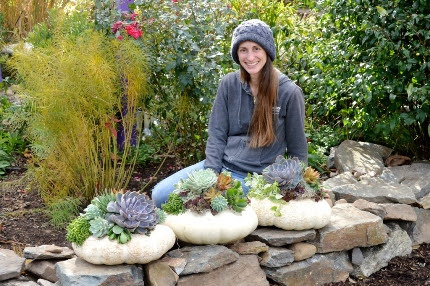 Kassie will teach you how to cover the top of your uncut pumpkin with moss and then glue on a wide assortment of succulents. What’s so neat about this project is that all you have to do is mist the succulents once a week and they will last for months. Because the pumpkin is not cut, but instead left whole, it holds up beautifully. When the pumpkin is finally finished, you simply peel off the moss covered layer of succulents and place it in a clay pot filled with soil. You then have a succulent garden to enjoy for the winter and years to come. Both of these workshops have limited space so call and sign up today. 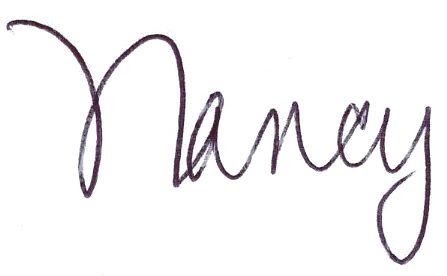 Why not sign up with a friend? My staff and I are starting to make a lot of short teaching videos and putting them on our Natureworks Garden Center YouTube channel. What? You didn’t know we had a YouTube channel? Of course we do! Last week my video showed how to layer different bulbs on top of each other when planting. This week I am demonstrating how to use the garden sickle to cut down perennials the easy way. CLICK HERE to link to this video and then spend some time checking out the other videos we have made. Sales, lots of new merchandise, a weekend of workshops… we have SO much in store for you at Natureworks right now. Treat yourself to a visit. Tune out the election madness for a while, stroll our gardens, listen to the hum of the bees, and relax in the present moment our our magical acre.